Orders for Fireworks, Sparklers or Smoke Grenades (DG) require a signature upon delivery, If you are not generally home, consider shipping to your workplace. Or we can ship to a nearby Hold-for-Pick-Up location. Choose this shipping method if your order contains Fireworks, Sparklers or Smoke Grenades (but not Smoke Emitters). Note: Dangerous Goods orders are subject to higher shipping fees because of surcharges imposed by Canadian couriers for special licensing & handling. We do our best to minimize these fees to our customers: the more you order, the less you pay for shipping. Customers in Toronto (GTA) receive Free Delivery on orders over $150 + tax. Customers outside the GTA receive Free Delivery on orders over $150 + tax (excepting NL, NT and YT and certain 'Beyond Point' destinations). Please note that DG deliveries are normally on time but not time-guaranteed. Choose this shipping method if your order contains Flying Lanterns, Glow or LED Products, Confetti Items, Colour Smoke Emitters, Colour Smoke Cannons or Remote Firing Systems (but NO Fireworks, Sparklers or Smoke Grenades). Shipping rates are lower, since there is no DG fee. Express Shipping is available. Also, these orders can be dropped with no signature required. Free Shipping offer (with min purchase) still applies. 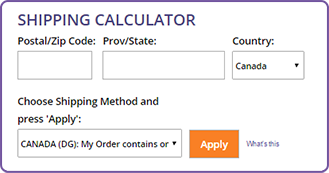 Once you have finished adding your items to the Cart, use the Shipping Calculator in our Store Shopping Cart: enter your Postal Code and Province, choose the appropriate shipping method and then press 'Apply'. Or please refer to our Shipping Rate Chart (below) to determine fees (if applicable) for Fireworks delivery to your area. REMOTE RURAL ROUTES OR 'BEYOND POINTS': An extra Charge may apply. We will contact you if applicable. 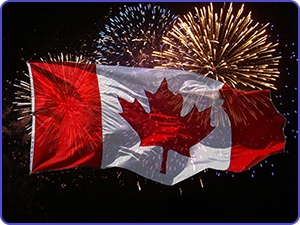 Rocket Fireworks provides year-round Fireworks Delivery across Canada, direct from our warehouse to your door. Take your display to the next level: place your order today!